Weaning your baby can be an anxious and exciting time. There are so many different methods out there and differing information about the dos and don'ts of starting your baby on solid food, so it can be hard to know what to do. Some say start at 4 months and some say 6 months. Some say to start with purees and others say to give them what you are eating. 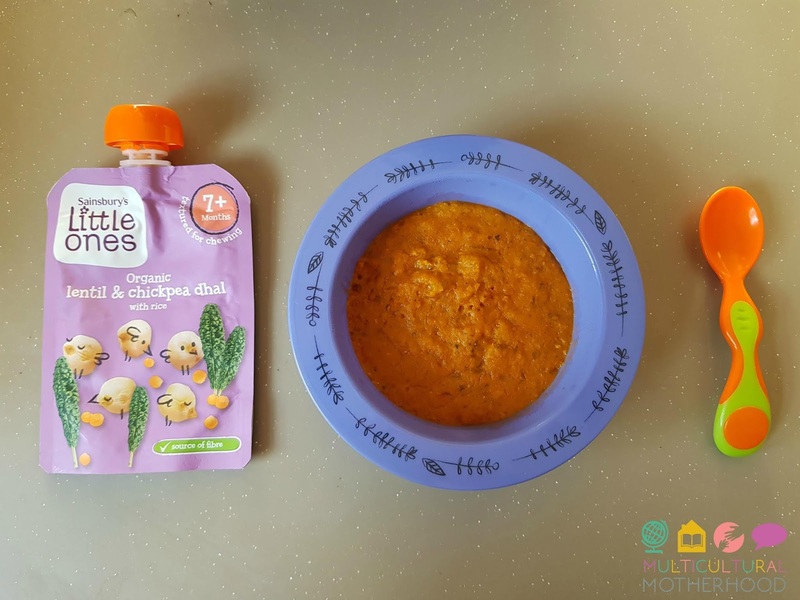 As a mother of four, currently weaning my fourth baby, a mixture of both methods has worked really well for us and this is where Sainsbury's Little Ones baby food has come in handy. 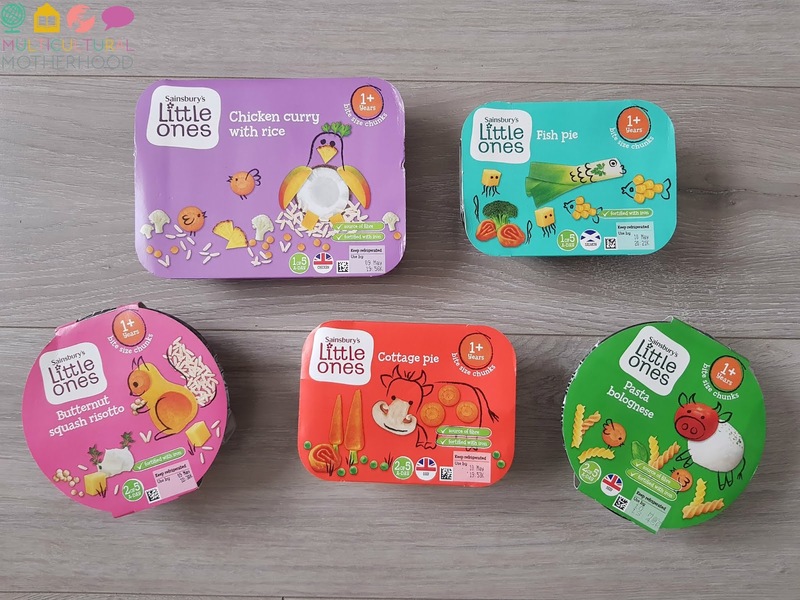 Sainsbury's Little Ones baby food range has been created in partnership with Fiona Wilcock, a top nutritionist. 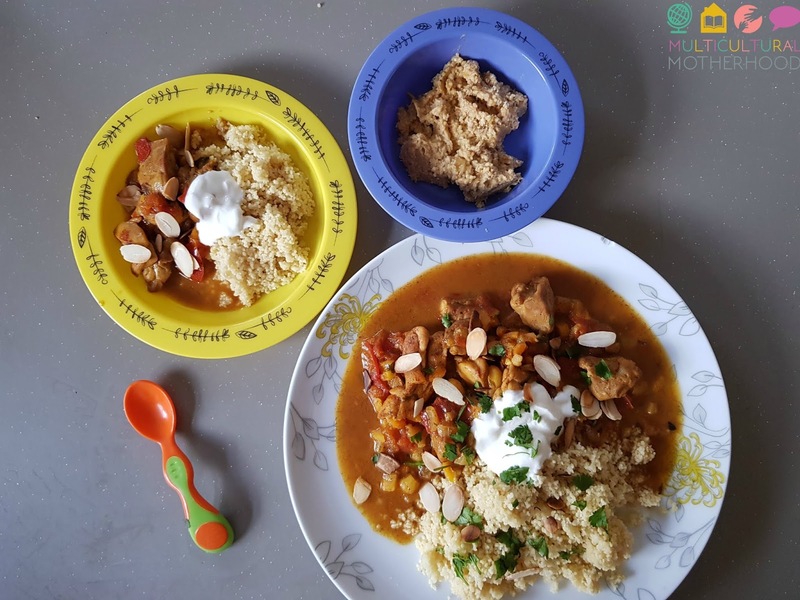 Together they have produced a whole range of baby and toddler food suitable for babies from 4 months old until well into toddlerhood. From baby cereal to fruit purees and savoury dishes, there is a wide range of food for your babies and toddlers to enjoy. Starting with the 4-6 month age range, there are fantastic smooth purees that any baby will love. 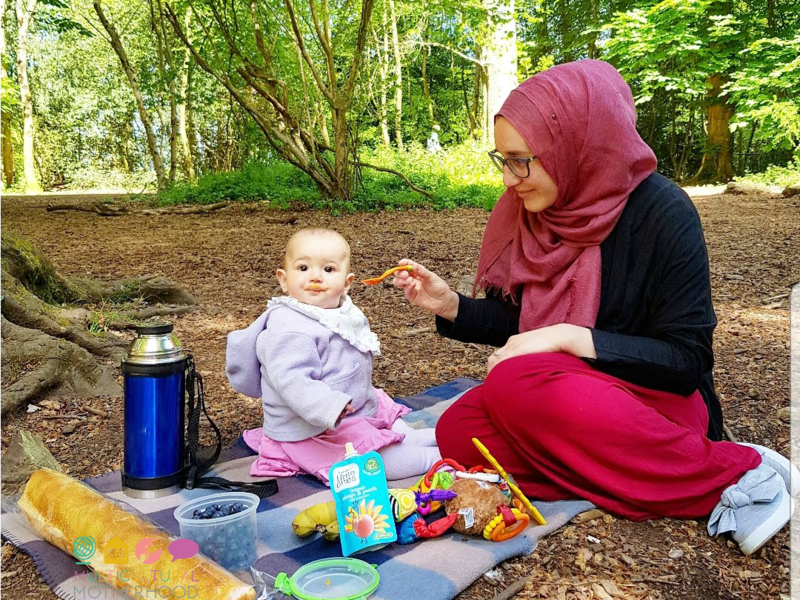 Asiya has been enjoying the fruit puree pouches and particularly loves the organic peach, mango and baby rice puree. There is a number of single flavour purees, such as parnsip or sweet potato for 4-month-old babies but there are some mixed flavour purees too such as the organic parsnip, pumpkin and white bean risotto. Sainsbury's have used less sweet foods, such as fruits, in the Little Ones range to try and get babies used to savoury flavours too. I love how they have a selection of vegetable purees such as organic sweet potato puree and organic broccoli, pea, spinach and kale puree. At 6 months old, babies can start to be introduced to new flavours as well as allergens such as dairy and gluten. 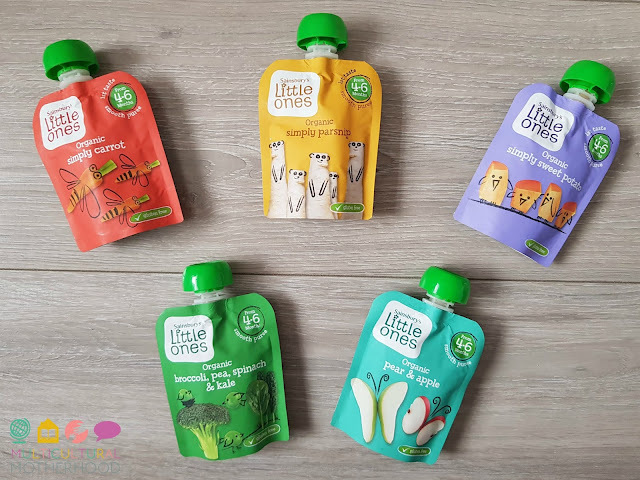 There are a number of products in the Little Ones baby food range suitable for babies from 6 months old such as the organic cauliflower and broccoli cheesy pasta and the organic beef casserole with sweet potato mash, parsnip and beetroot. The Little Ones baby food range includes a number of breakfast cereals. 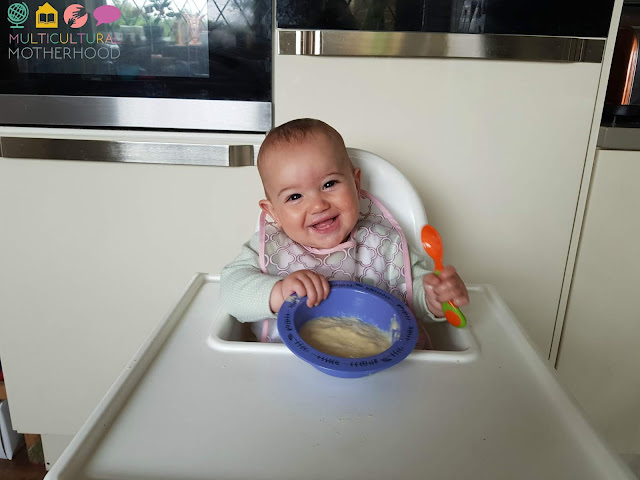 Baby porridge is always a good option and Asiya has been enjoying the organic banana multigrain porridge for breakfast. 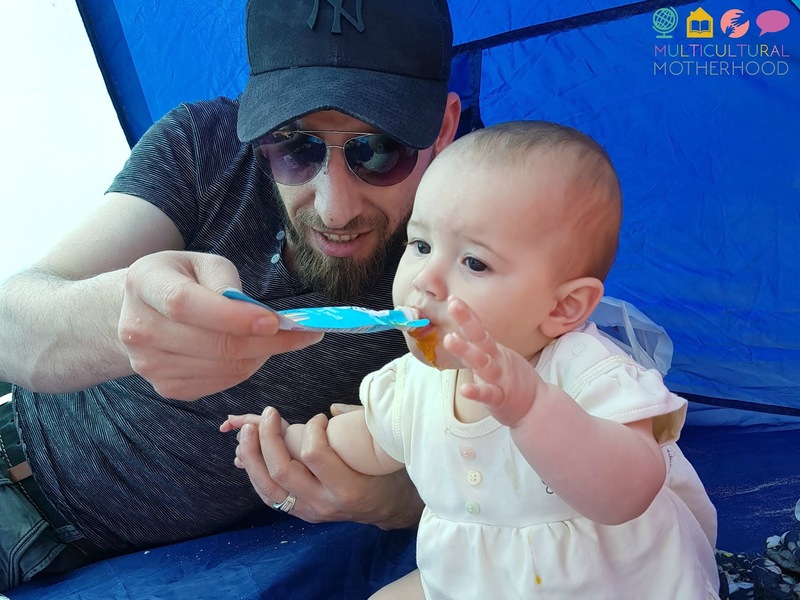 Breakfast can be one of the hardest meals of the day to find suitable options for baby, but this baby porridge has made it easy for me. Asiya really enjoys it. As baby gets older, more texture is introduced so the baby food gets lumpier with pieces of fruit or other foods in it. It is important to give babies more textured food as they get older as they need to develop their muscles for chewing. These muscles are also important for speech and language development. Asiya has just turned 7 months and she has been enjoying the organic lentil and chickpea dhal. From 7 months old babies will be able to enjoy the fruit purees with fruit pieces in them such as the organic apple, peach and mango puree with apple pieces. 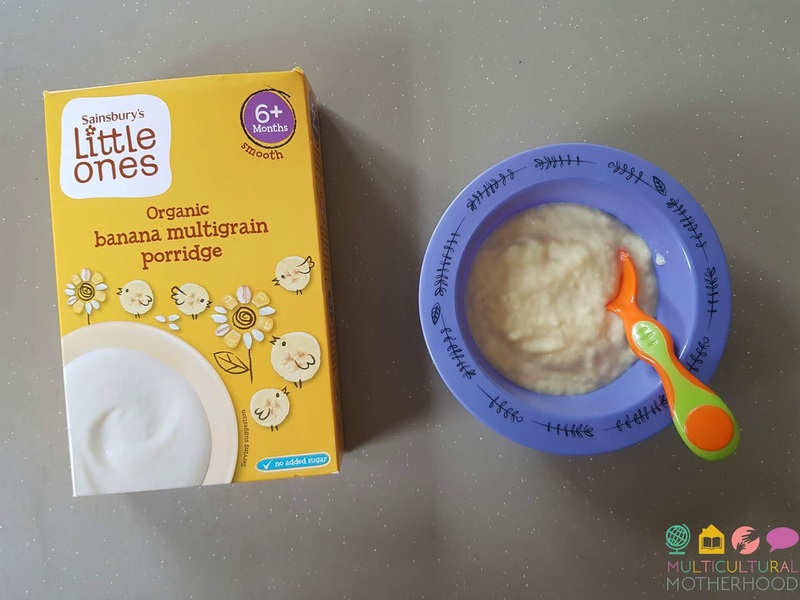 Asiya loves this puree and often has it stirred into yoghurt for breakfast. Sainsbury's want to take babies on a flavour journey from their first tastes at 4 months old through to toddlerhood. They do this by taking a certain flavour and cleverly adding more flavours to it at each stage. This is called the taste progression. For example, babies of 4 months old would start on the sweet potato puree. They will progress onto the sweet potato, carrot and swede puree, then the chicken casserole with sweet potato and finally the beef casserole with sweet potato, parsnip and beetroot. By gradually adding flavours, it gives babies a chance to get used to each flavour and they go on a flavour journey as their taste buds develop. Sainsbury's has also developed some delicious ready meals suitable for babies and toddlers from 12 months and older. 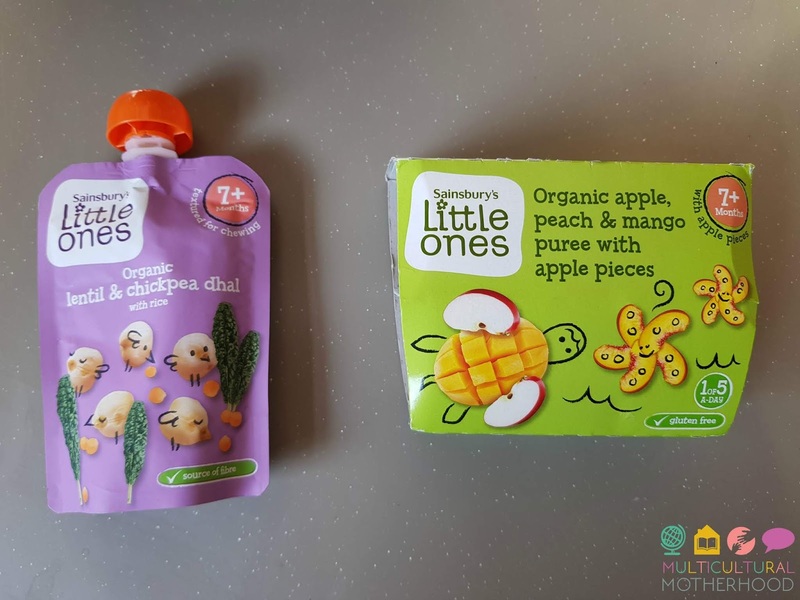 Kamil is almost three and has been trying out the Little Ones toddler food range. 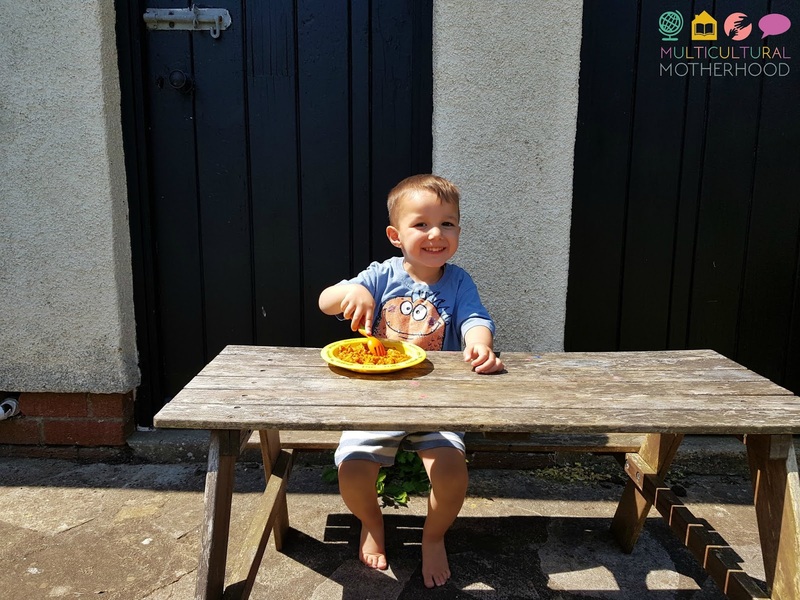 In particular he has enjoyed the cheesy tomato pasta, pasta being his favourite food, as well as the butternut squash risotto. Sainsbury's aim for their Little Ones baby food range to be used as a healthy, convenient option alongside home cooking. Therefore, they have developed a whole range of recipes to complement their ready-made baby food options. My toddler loves to help me in the kitchen so we tried making one of the Little One's recipes together. We made the 'Easy Chicken and Apricot Tagine' which was indeed easy to make and packed full of flavour! I pureed some for Asiya and the whole family enjoyed it. I will definitely be trying more of the Little One's recipes. One of the best things about Little Ones baby food is that it is so convenient. I love being able to take the baby food pouches out and about with me. They make feeding baby on the go super easy. I love the fact that all Little Ones baby food is organic up to the age of 12 months. After 12 months, the toddler food has been fortified with iron and, because of this, it can no longer be classed as organic. 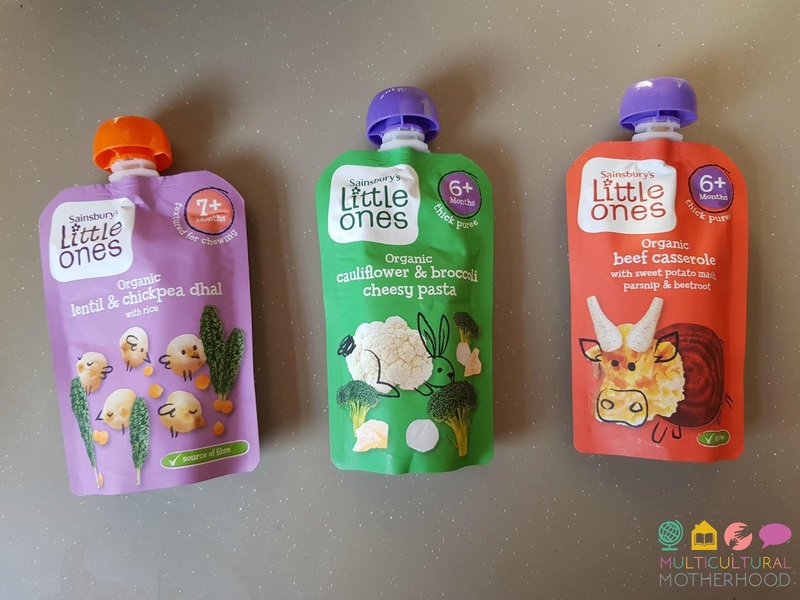 Unfortunately, the Little Ones baby food range does not have any halal meat options which meant we could not try any of the meat-based food. However, there are lots of vegetarian and fish-based options which Muslim families will be able to enjoy. I have mentioned many of the vegetarian options above and some of the fish-based options include fish pie, cheesy tuna pasta and sweet potato, carrot and salmon puree. We have loved trying out the new Little Ones baby food range from Sainsbury's over the last 5 weeks. 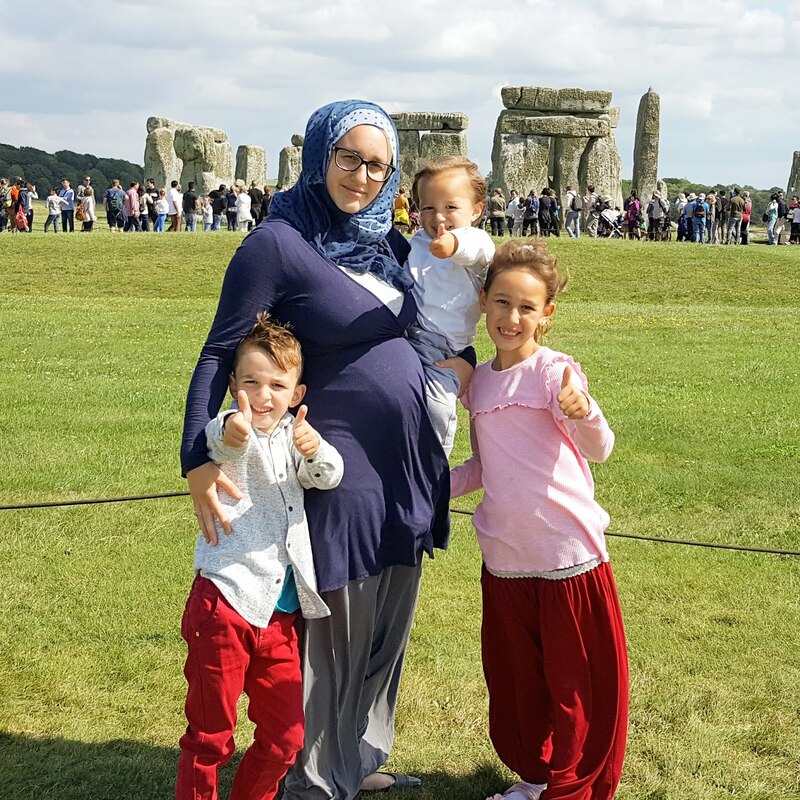 Asiya has been on a flavour journey and it has been wonderful to see her tastes develop. I have enjoyed the convenience of the baby and toddler food, especially at breakfast time or while out and about. The toddler food has been a hit with my toddler as well as my older children! Also, the wonderful packaging, with the fruit and vegetables turned into animal characters, has been a great way to get my toddler interested in the food. He loves to point out the different animals on the packaging! We will continue to use the Little Ones baby and toddler food as it has been such a hit with my children. I would recommend it to anyone who would like healthy, organic, convenient and tasty food for their babies and toddlers. Disclaimer: This article is sponsored by Sainsbury's. They sent me the baby and toddler food to try out and paid me for my time.